Need a Logo to be designed for a website. Please do not use/copy any copyright content from any site like shutterstock or any other site. Copyright content can cause serious damage and legal consequences. Any such submissions will be rejected and also blocked from submitted more logo, plus reported to Freelancer. Please be professional and showcase your talent of creativity by coming up with original content. Request to participants : If you notice a copied Logo from anywhere, please comment on the submission with the link to the original content and I will block the non-professionals right away. Need 5 different resolutions of the Logo and different file formats. I have some ideas but I would be interested in your creativity. Not looking for logos like from free websites etc. Looking for something pure custom built and high quality. Please share ~5 sample designs, different Color Combinations that you propose (even rough sketches will work) before you build the final hi-res ones. Take a look at the website. There are competitions, news articles, user profiles and events. Sorry but I won't be able to provide program access for Coral draw etc. Hopefully, you have a copy of an industry software. 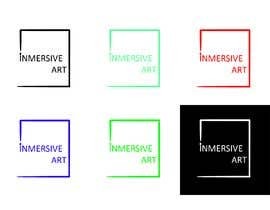 Some Suggestions : A symbol + the Word Immersive Art would interest me. C. A Symbol but has to be really unique and Stylish and impressive. Also, try to create a design that can have a white background primarily and can be switched to a colored background. Please look at the attached sample. Try making something with an I and A without 3d letter and in sans-serif or non-cursive type. Increased the end date and prize amount.